The Raiders have four of the first 35 picks in the 2019 NFL Draft, including three first-rounders — No. 4, No. 24 and No. 27 (the 24th and 27th selections are courtesy of trades involving Khalil Mack and Amari Cooper). On the heels of a 4-12 record, there are plenty of needs and when the draft gets underway on April 25th, new general manager Mike Mayock insists the team will be prepared. Should Oakland move up from the fourth overall pick, it might be for Okahoma’s Kyler Murray (full profile here), the Heisman Trophy winner who could be the first player off the board. Such a bold move would also effectively end the Derek Carr era in coach Jon Gruden’s second year. Mayock warned against reading too much into the the Raiders holding private workouts recently for Murray and Ohio State quarterback Dwayne Haskins (full profile here), another likely top-10 pick. 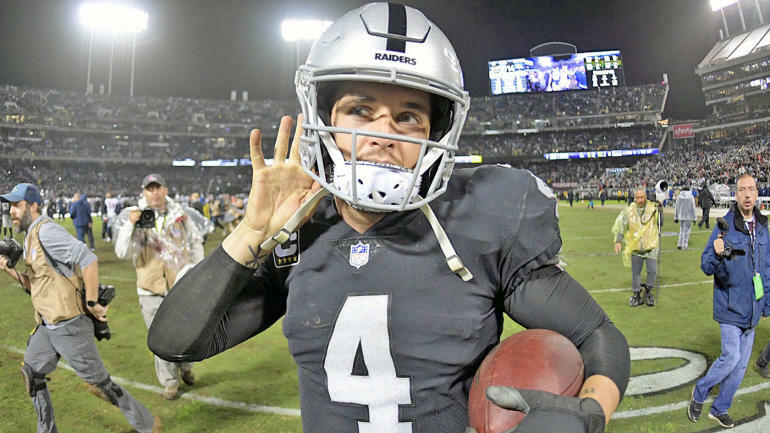 “I’ve said before … Derek Carr is a franchise quarterback, and we believe that,” Mayock said. “Beyond that, just like at any other position, we’re going to do our due diligence. If we found somebody we liked better, or thought had a bigger upside, you’ve got to do the right thing for the organization. This meshes with what Gruden said earlier this month in an interview with NFL Network. We don’t think the Raiders would trade up to No. 1 to get Murray, but things get interesting if the Cardinals, who have the first pick, pass on him. Then we’d see just how much Gruden was all in on Carr. More likely, however, is that Oakland addresses needs on defense. But here’s something else to consider: The Raiders filled a lot of needs through free agency — mostly on offense — and if they draft, say, Quinnen Williams at No. 4 they could package some variation of picks No. 24, 27 and 35 to move up in the first round to draft an edge rusher like Rashan Gary, Brian Burns or Montez Sweat. The machinations of how this could unfold hasn’t been lost on Mayock. In our latest mock draft we had them taking Williams at No. 4, Greedy Williams at No. 24, Josh Jacobs at No. 27 and Irv Smith Jr. at No. 35.